Thanks to my Mother-In-Law, Mommy Cindy, for this wonderful recipe. Her version is something new to me as I only had the regular roasted or fried chicken that my grandmother or house helpers would cook during my younger years. I’ve never appreciated Roasted Chicken until I tasted hers. It’s lemony. It’s buttery. It’s tangy. It’s tasteful. Below is the recipe for our family’s “Pollo con Hierbas ala Dreyfus”. It may have been our family’s best kept secret… But a secret as delicious as this, cannot be kept to one’s self only! In a separate bowl, make chicken rub by blending calamansi (local lemon), thyme, rosemary, half of minced garlic and ginger, salt, crushed pepper and crushed Knorr chicken cubes altogether. Vigorously rub all over the the chicken, outside and inside parts. Stuff the chicken with lemongrass, parsley and the remaining garlic, ginger, thyme and rosemary. Place the prepared chicken in a pot or bowl and cover with a plastic wrap. Refrigerate overnight. Place the chicken in the turbo broiler’s roaster. Set on High for 2-hours. The chicken will be so tender and juicy! Every 30mns, brush the chicken’s skin with butter to give it a golden brown color and crispy skin. For Oven users: Pre-heat at 350 degrees F. Cook for 3-hours. Follow the same cooking instruction. While waiting for the chicken to cook, boil the vegetables. But DO NOT overcook it! Sprinkle with table salt. Gravy: In a separate pan, melt 1/4 cup of Anchor butter. Pour the chicken drippings and remaining marinade. Let it boil. Set aside. 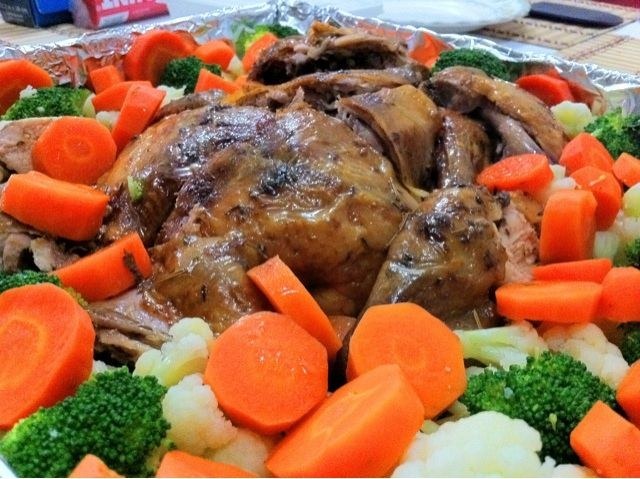 Arrange the roasted chicken on a serving plate (stuffing removed) and garnish with veggies around it. Serve with rice or dinner rolls. Or you can make mashed potatoes, too. Perfect for a nice Sunday lunch at home. Happy cooking and enjoy eating!